A young woman showing up at a cemetery and crying in front of a grave for five nights in a row has caused a stir in Turkey's central city of Çorum. 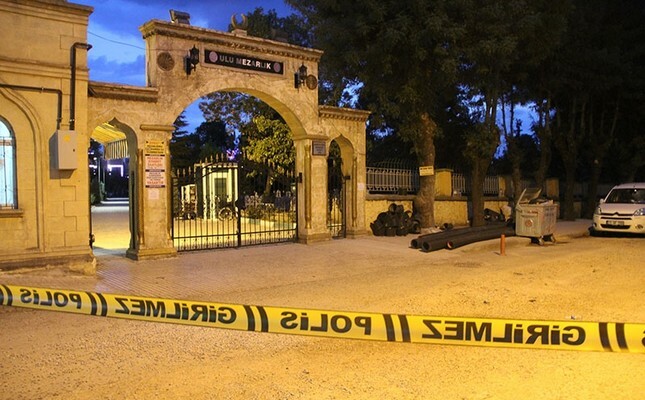 Employees at the Grand (Ulu) Cemetery located in the city's Çepni neighborhood saw the unidentified woman, believed to be 17 or 18 years of age, on the night of April 26, crying next to a grave. The same girl was also seen near the grave of Fatma Ç., who died in 1982, in the next three nights. The issue turned into a local sensation, prompting officials to left a note by the grave on April 30, asking the girl to contact them if she needs help or support. The police launched a search operation to find the girl as the locals were both curious and frightened by the incident. Many locals arrived in the scene to see whether the girl will come by the grave, only to be turned away by the police. The girl, wearing black clothing and red shoes, came by the grave Tuesday night, but ran away in the dark as the police was trying to catch her. On Wednesday, the police had to set up a security barrier around the cemetery to keep away some 300 curious bystanders, with some bringing snacks, waiting to see if the girl will come again. A group of youngsters tried to enter the cemetery through the wall with a ladder, leading to a brief scuffle with the police and four people being detained. A night vision compatible security camera and a photo-trap were installed near the grave by the Çorum Municipality to capture the girl's footage and to identify her. The police conducted a thorough search in the cemetery and surrounding areas for eight hours but could not find any evidence. "She is probably a drunk or a drug addict," Ömer Şen, a professional gravedigger who works at the cemetery as he dispels rumors among locals claiming she is "a ghost." "It is impossible," Şen told Doğan News Agency, while lamenting the incident "gave Çorum a bad name."